This easy recipe is a sponsored post written by me on behalf of Unilever. All opinions are my own. With so many great recipes to make with I Can’t Believe It’s Not Butter!, I had a really hard time choosing the one I would make. Fate kind of chose for me. I had planned on making delicious chocolate covered fruit. It seemed like such an easy recipe at the time! I bought all the ingredients, got out my fondue pot (because I never have a chance to use it!) and got started. Well, it was an epic fail on massive proportions. I’m not sure if I bought the wrong kind of chocolate, let it get too hot, didn’t get it hot enough, or what. The chocolate dip turned into a grainy, nasty blob. Not exactly the look I was going for. So there I was, a deadline approaching and no real time to run to the store. I knew I needed an easy recipe with very clear instructions. Back to the I Can’t Believe It’s Not Butter website to look for recipes! 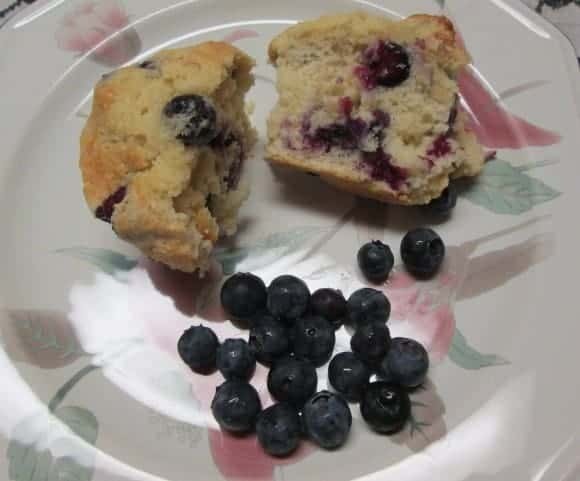 I found this awesome Blueberry Muffin recipe and thought “hey, I have blueberries, and I’m pretty sure I have the rest of the stuff, so this will work!” The only thing I didn’t have was lemon zest, because I’m not really sure what that is. I did have lemon extract, though! I’m not sure why, but I have it! So I managed to turn their recipe into something a little different without completely goofing it. Go me! Now, it’s important to note that when I say its an easy recipe, I mean it. Unlike the other writers here at OurFamilyWorld, who all seem to be culinary geniuses (seriously, have you seen our amazing recipe section? I am always in awe! ), I’m what you would call a novice cook. I can bake okay, though! The original recipe called for a whole stick of I Can’t Believe It’s Not Butter! I misread it and thought it said 1/2 stick. I panicked the entire time the muffins were in the oven, thinking “oh no, another epic fail!” Well, they still came out perfect! If you prefer to follow directions, go ahead and add the whole stick. Just know that it’s fine with half of that. Preheat oven to 400 degrees and get your muffin pan all ready. Either line it with muffin liners or spray it with cooking spray. Combine the flour, baking powder and salt into a medium bowl. Combine the butter, sugar, eggs and extracts into a larger bowl. 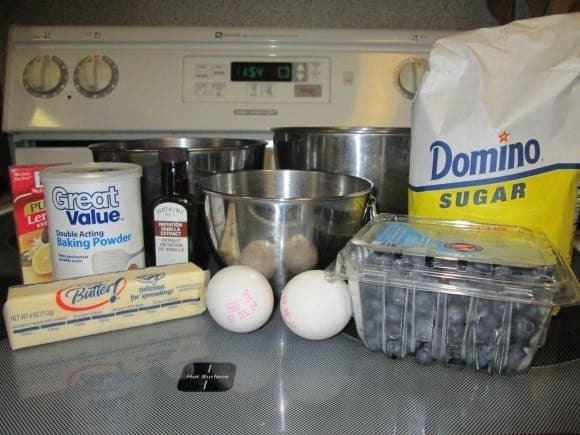 Toss the blueberries in a bit of the flour mixture and put in a small bowl. Get your milk out and leave it in the cup next to your work area. Mix all the bowls, along with the milk, together into the wet ingredients bowl. Technically, you’re supposed to “fold” them in. I don’t know how to fold ingredients. I just dump half, stir, then dump the rest and stir. It works just as well as this fancy “folding” thing. When you get to this point, you’ll notice two things. First, your batter is pretty thick. This should have been the signal that I didn’t add enough of something. Second, you have a lot of batter! 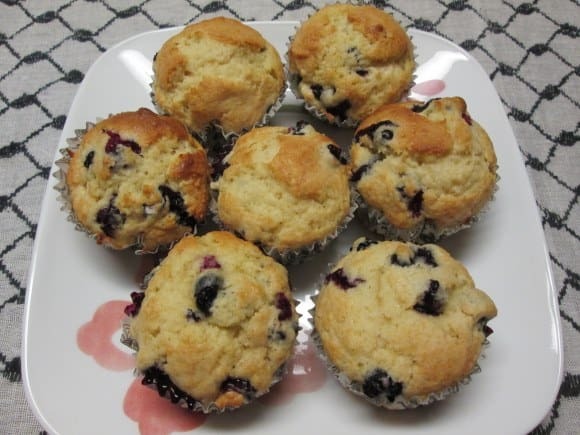 This recipe makes very nice-sized muffins. Not quite monster muffins, but pretty close! 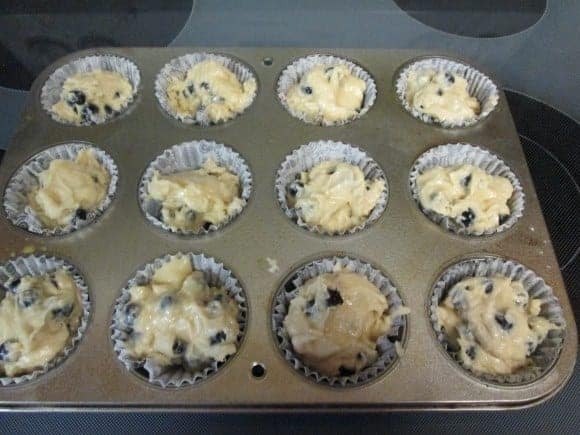 Use a tablespoon (preferably not the one you did the mixing with, because if you’re like me, you tasted the batter despite the fact that you know you’re not supposed to eat anything with raw eggs in it) to drop batter into your prepared muffin tin. Fill them up! I filled mine almost to the top. Bake for 23 minutes, or until the top is a nice golden, done-looking color. Or, you know, you could do that fancy “toothpick in the center to see if it comes out clean trick.” I prefer to just wing it. Prefer to watch the directions in video format? I have one of those for you too! I’ll tell you right now, though, that I get really nervous on video. I also sound like I’m about 12 years old. Still, it was fun to make! Ta-da! 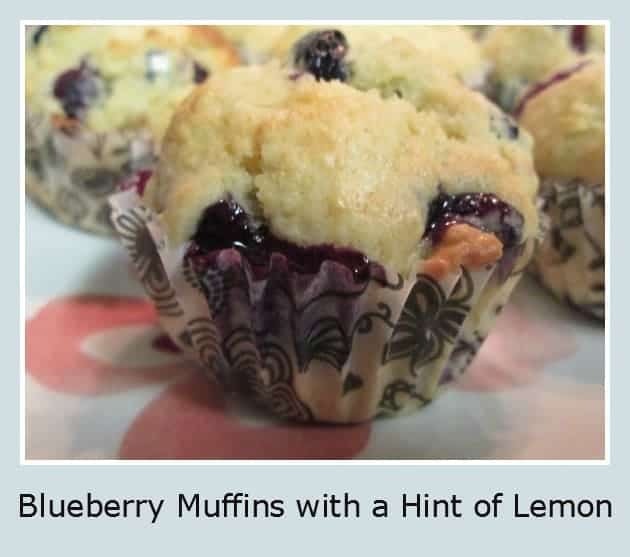 This easy recipe makes 12 delicious blueberry muffins with just a hint of lemon to give it a little flavor boost. I am so proud of how they turned out! I’ve never made blueberry muffins from scratch before! Thanks to I Can’t Believe it’s Not Butter! I stepped outside my boxed-food comfort zone and come up with something really yummy! Plus, there’s no compromising on taste when you use I Can’t Believe it’s Not Butter! instead of regular butter. I love that I’m getting a good amount of my Omega-3’s in these muffins without the added trans fats. For more great easy recipes using I Can’t Believe It’s Not Butter! and other tasty spreads in the family, check out It’s Good to Know. Cooking your favorite recipes using Unilever buttery spreads is a deliciously smart move. With 0g trans fats per serving, less saturated fat and fewer calories than butter, cholesterol-free spreads are a better option. Visit itsgoodtoknow.com for more information and recipe ideas now! This is a sponsored post written by me on behalf of Unilever. How Far Can Your Child’s Imagination Go? Make Your Small Spaces Gorgeous with these Decorating Tips! I would try the roasted cod with bell peppers! Sweet & Nutty Snack Chips! I’d like to try cod & bell peppers! I would like to try the Chicken Sandwiches With Basil Aioli. The Garlicky Chicken Sandwich sounds good to me! I would like to try the Garlic Smashed Potato Cakes. I would love to try the Grilled Chicken Sandwiches With Basil Aioli. I’d like to try the Cinnamon Walnut Power Bars. Chili Parmesan Popcorn & Peanuts! The Garlisky Chicken sandwich recipe!! Cinnamon-Walnut Power Bars— sounds like a great on the go snack! I’d like to try the easiest ever french toast! I would love to try the Chili Parmesan Popcorn & Peanuts, yummy! Would love to try the Apple-Pecan Stuffing! Sounds absolutely delicious! The tortilla crusted chicken breast sounds lovely. I’d love to try the Dutch baby pancakes. We got to try some pancakes at a restaurant this past weekend and I’d like to try to see if they would end up the same! I’d like to try the coffee-infused chocolate cupcakes. I’d love to try the Garlicky Chicken Sandwich. Roasted Cod with Bell Peppers, yum! I want to try the One Bowl Chocolate Chip Cookies. It’s Good to Know! I like that Chicken Sandwiches with Basil Aioli recipe! I would love to try Sweet Potato Pie! I would love to try and make the Greek Garlic-Oregano Roasted Chicken Dinner looks so yummy! The Coffee-Infused cupcakes with frosting sound yummy. Tortilla-Crusted Chicken Breasts look yummy! I’d like to try Creamy Shrimp Risotto! Cinnamon-Walnut Power Bars looks awesome! I’d like to make Stuffed Chicken With Goat Cheese – thank you. Yum! My kids would love the baked fingers! The one bowl Chocolate Chip Cookies. The cinnamon walnut power bars look yummy! I’d like to try the Lemony Walnut-Crusted Fish Fillets. These muffins look so good! I’d like to try the Tortilla-Crusted Chicken Breasts recipe, too! I would love to try the Tortilla-Crusted Chicken Breasts. Thank you for the amazing giveaway! This recipe looks so delicious. I cannot wait to make this. I would love to try the Pizza Flag. I want to try the Cinnamon-Walnut Power Bars! I’ve got the Apple Maple Upside-Down Cake marked to try the next time I have some apples. Thanks for pointing me to those recipes! The Herbed Garlic Bread looks so good! I would love to try out the Coffee-Infused Chocolate Cupcakes. Yummmm! I would probably pick the Loaded Mashed Potatoes and the Easiest Ever Spoonable Corn Bread recipes. I would like to try the Tortilla-Crusted Chicken Breasts. Grilled Chicken Sandwich with Basil Aioli. I love Aioli. The Classic Macaroni ‘N Cheese sounds great. The honey glazed carrots look good. The cinnamon walnut power bars look good. I always make my husband a batch of granola/protein bars to take with him when he goes backpacking. Might have to try this one next time. I’d like to try the Herbed Garlic Bread! coffee infused cupcakes with frosting. The Delicious One-Bowl Chocolate Chip Cookies. Yummy! I would like to try the Spicy Oven Fries. I want to try the pizza-styled grilled cheese! Hi, I’d love to try the Lemony Walnut-Crusted Fish Fillets, looks so yummy! I’d like to try the Greek Garlic-Oregano Roasted Chicken Dinner recipe. Would love to try the Shallot & Thyme Buttery Compound recipe! I’d like to try the Cinnamon-Walnut Power Bars. I’d Like To Try The Apple Maple Upside- Down Cake Recipe! I’d try the Delicious One-Bowl Chocolate Chip Cookies. I’d like to try the Coffee-Infused Cupcakes with Frosting. They sound delicious! I’d like to try the Lemony Walnut-Crusted Fish Fillets! The Pizza Flag looks great. Yum! The tortilla crusted chicken breasts! I would love to try the Apple-Pecan Stuffing recipe. I think the Grilled Chicken Sandwiches With Basil Aioli looks delicious! I want to try the recipe for sweet potato mash. The breakfast pizza sounds good. I would like to try the Baked chicken fingers! I would love to try the Coffee-Infused Chocolate Cupcakes. the dutch baby pancakes look heavenly! Oh I would love to try the Coffee-Infused Cupcakes With Frosting! I would like to try the Dutch Baby Pancake recipe. I WOULD TRY THE Sweet Potato Pie. Grilled Chicken Sandwiches With Basil Aioli. I would love to make the Dutch Baby Pancakes. I’d like to try the oven roasted herbed chicken. Mmmm….I’d really like to try the Butternut Squash & Mushroom Lasagne. I would like to try Butternut Squash & Mushroom Lasagna recipe. The recipe for Lemony Walnut-Crusted Fish Fillets looks delicious! The Classic Macaroni & Cheese. Tortilla crusted chicken breasts, nummy! The coffee-infused cupcakes with frosting sound amazing! I’d like to try cinnamon walnut power bars. I’d like to try the Easiest Ever Spoonable Corn Bread recipe! I would love to make the coffee-infused chocolate cupcakes. Has Technology Created A Society Of Distracted Parents? Merry Christmas From OurFamilyWorld to Your Family World!